I think I’ve made it pretty clear that, while I am really adventurous when it comes to computer-aided anything, I am always willing to learn and use it (see my post on how I use Evernote in teaching and research). But my task-scheduling? It’s totally old-fashioned. I WRITE LISTS. By hand. And then I cross them off, delete them, or write a red check mark besides them. I know, it’s slightly embarrassing. I haven’t tried Wunderlist, but it seemed nice in that multiple lists can be shared with others, as per Megan Hatch’s note. @raulpacheco I also like wunderlist because you can have multiple lists and share with others. This one took me by surprise, as both Will Winecoff and Christopher Zorn recommended it for lists. I usually just use it to file notes, field notes, and for my teaching. But apparently I could extend it to To-Do lists. Everything I do is synchronized with Google (Gmail, Google Calendar), so it would seem to make sense that I try Google Keep. Never done it, might try it. @raulpacheco I use Google Keep. @raulpacheco Google Keep is solid (but simple) if you're already using Google. @raulpacheco I'm heavily reliant on Keep. It's like my little assistant. Keeps photos, lists, notes, whisky. Oh, wait. @raulpacheco I couldn't live without Todoist!
. @raulpacheco I use @todoist. Good and I've barely scratched the surface on what it can do. Jennifer Victor (George Mason University) suggested Timeful, which I also haven’t tried. But I will, although it seems it will be removed from the App Store, as it’s paired now with Google. @raulpacheco I like Timeful, but it's usefulness is somewhat dependent on frequent use. I suppose that's true of all to do lists. While I took project management courses in undergrad and during my Masters, and I do have *some* idea of what the Kanban flow technique is, this is totally new. Emily Senefeld suggested it and I might have to try it. @meganehatch @raulpacheco i use KanbanFlow. This was suggested by Ana Isabel Canhoto and I am looking forward to trying it too. I like that it seems simple and that it’s for iOS (which I use on my mobile devices). Ryan Briggs (Virginia Tech) suggested OmniFocus, and I have used OmniGraffle before to design website mock-ups and wire-frames. So trying another Omni Group app doesn’t seem too much of a stretch. And in response, Chris Parsons (University of Toronto) suggested any.do and Reminders (the app, although I think it’s been renamed to Due). 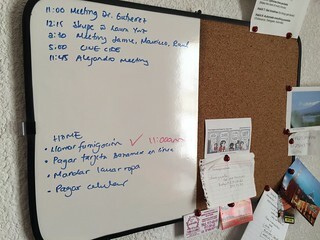 And sometimes as Lenore Newman (University of the Fraser Valley) suggested, good time management works.